I am lazy; I don’t like to work but I quite like watching others doing so, thus lunch at Neethlingshof Estate was particularly enjoyable. 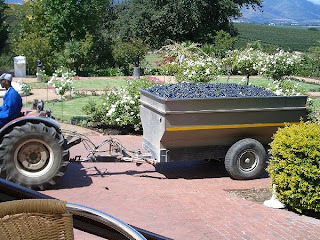 Not only were a team of gardeners being industrious in the flowerbeds but every now and again a tractor towing a grape hopper passed the restaurant veranda under me (see picture right to be unloaded into the de-stemmer almost opposite. 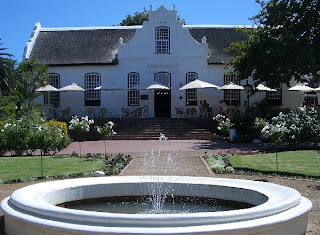 On one side of the courtyard is the old manor house with the Lord Neethling restaurant (see picture below left) and facing it on the other side is the winery building and tasting room. And every now again during harvest visitors and tour groups are scattered by the need to tractor in freshly gathered grapes. The restaurant serves a good Escalope of Veal Milanese – a dish to which I am very partial and which just suited a bottle of Neethlingshof 2002 Pinotage (95 rand). I found this wine a little too tannic at first; it definitely needed food, though as time went on it opened up delivering some bright berry flavours. I’d met Neethlingshof’s winemaker, De Wet Viljoen at a party a few days and when I said I was coming for lunch he insisted I ask for him when I arrived which I did, only to be told that no one of that name worked there. “But he is your winemaker!” I exclaimed. It was then I had some help on my slow and stumbling path to speaking Afrikaans and learned to say D’Vet Vill –Yo – en. De Wet is one of the nicest people in the business and a good friend of Pinotage, and he offered to organise a tasting of Pinotage from the Cape Legends portfolio. Cape Legends markets fourteen brands from eleven wineries. Each winery operates as a separate company, some are part owned by Cape Legends' owner Distell, some are privately owned with only Plaisir de Merle being completely owned. Soft ripe plum and berry fruits, immediately appealing, some very soft tannins and a tangy finish. Hill & Dale (Hillandale was the name of a real farm) is made by Stellenzicht’s winemaker Guy Webber using fruit that didn’t end up in Neethlingshof and Stellenzicht. Good deep colour, firm bodied black cherry flavours, drying finish. “I’ll see what I can do,” replied Carlen. And she did – but that is another story. This wine was fuller bodied and rounder with more fruit flavours than the one I had with lunch at the Neethlingshof restaurant. “It is cooler and has been open longer” explained DeWet. But it still dried the mouth with some firm tannins on the finish. Definitely needs food. Deep garnet colour, silky and spicy front palate with some wood underneath. Umm, this is quite complex; a moreish wine. Bright dark red colour, purple rim, looks quite young. Very sweet upfront strawberry and cherry flavours. Mouth filling, great structure and balanced tannins with a medium finish. Bright dark red colour, wooded nose, there’s berry fruits and a sweet feel but a firm middle and a wooded finish. Thanks to De Wet (pictured right) I was also able to taste, prior to release. Wow, wonderful deep fruit flavours and soft soft tannins, great depth and complexity, this is a super wine that just begs to be drunk. Many thanks to Carlen and De Wet. 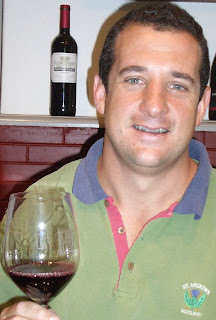 Peter F May is the founder of The Pinotage Club, an international cyber-based fan club for wines made from the Pinotage variety. Peter was awarded Honorary Membership of the producers Pinotage Association in 2004 and was a judge at the annual Pinotage Top 10 Competition in 2004 and 2005. Peter is a wine writer, educator and author. His book PINOTAGE: Behind the Legends of South Africa's Own Wine may ordered below and from Amazon. Marilyn Merlot and the Naked Grape - odd wines from around the world was published in summer 2006. Peter answers all polite emails - contact him at peter (at) pinotage (dot) org . What dedication do you want? Dr Perolds report on his Paarl experiments 1915 - 1916 reprinted with glossary, introduction and brief biography. Fascinating historical document on viticulture for wine and table grapes, wine and brandy making. Pinotage = Pinot Noir x Sancerre? A 1970's Banana Metal Band? Pinotage & Vindaloo? No Problem! Amoritas Vineyards 2016 Leelanau Peninsula Chardonnay: It All Started with Wine Tasting! Text and Photographs are Copyright and may not be used without permission.